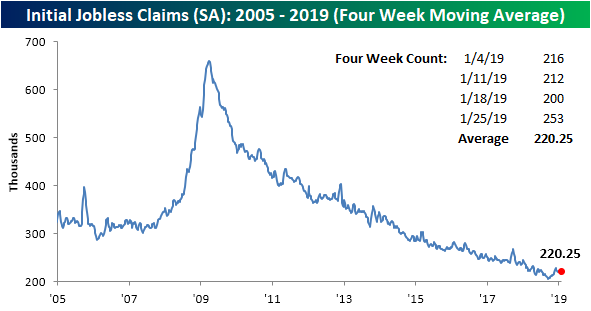 This morning’s release of Initial Jobless Claims seems to have made an about-face from the impressively strong reading of 199K seen last week. 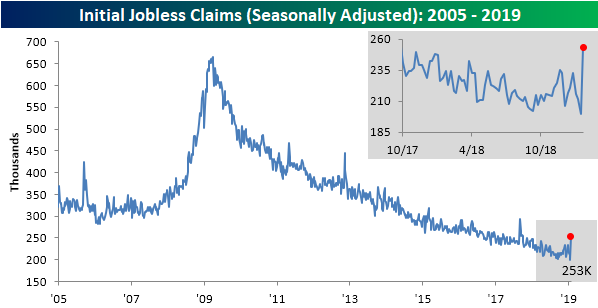 On a seasonally adjusted basis, claims for this week not only went back above 200K but skyrocketed all the way to 253K; their highest level since September 2017. This week’s number also far surpasses the recent jumps seen in October and November of last year when they rose to around 230K. 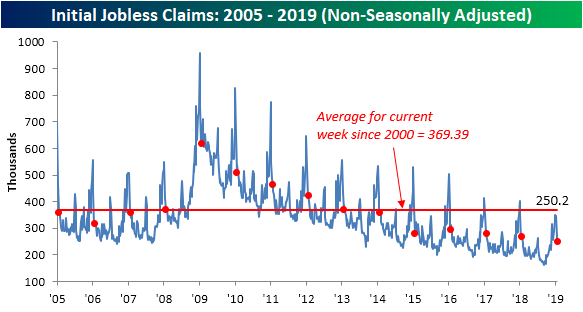 This spike in claims brings an end to the streak of 68 weeks with the seasonally adjusted number coming in below 250K. That was the longest streak since the 89-week streak that ended in January of 1970. Granted, the indicator still has 47K of insurance in its streak of remaining under 300K. That streak is now at 204 weeks long, so while this week’s data raises an eyebrow, it still maintains a healthy level. Give the large spike in claims, the four-week moving average also rose with a 5K uptick this week to 220.25K. That is right back in line to where the moving average was back in November and December. With the large reading from this week staying in as an input to the average, it will likely remain somewhat elevated for the time being.